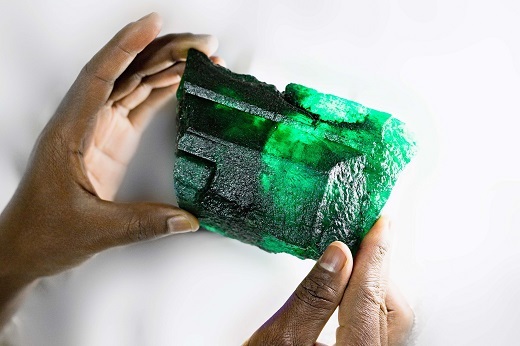 RAPAPORT... Gemfields has recovered a 5,655-carat emerald at its Kagem mine in Zambia, it said Monday. The emerald has “remarkable clarity and a perfectly balanced golden-green hue,” Gemfields noted. Geologist Debapriya Rakshit and veteran miner Richard Kapeta found it on October 2 in the eastern part of Kagem’s largest open-pit mine, from which the company has unearthed several significant stones recently. Gemfields named the stone the Inkalamu, or Lion Emerald, in honor of two of its conservation partners — the Zambian Carnivore Programme and the Niassa Carnivore Project. It will sell the piece at its next auction in Singapore in November, and donate 10% of the proceeds to those groups, it said. Gemfields will use Gübelin Gem Lab’s traceability program, Provenance Proof, to ensure the emerald’s origins remain identifiable, it added. All smaller stones cut from the Inkalamu will also carry the tracking technology.